Chinese search leader Baidu and Rakuten, Japan’s largest e-commerce player, have announced an agreement to jointly invest US$50 million over three years in a joint venture to build a huge online ‘B2B2C’ shopping mall for Chinese Internet users. Under the terms of the agreement, Rakuten will become majority shareholder of the new, yet to be named joint venture (51%) with Baidu owning the remaining 49%. B2B2C refers to an online marketplace that links and provides value-added services to both business to business and business to consumer. The online mall, which is expected to go live in the second half of 2010, aims to provide customers with merchandise from well-known Chinese and foreign brands as well as small and medium sized enterprises at ‘competitive prices’. The mall is anticipated to quickly become the largest online B2B2C shopping mall in China. Rakuten sure has the experience of running such ventures: founded in 1997 as MDM Inc., the company operates Rakuten Ichiba, Japan’s leading Internet shopping mall with over 30,000 participating merchants and over 47 million items registered on its e-commerce platform. 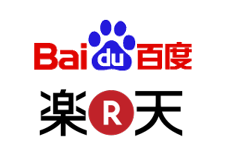 Baidu, meanwhile, has seen two top executives depart the company just this month (both CTO Yinan Li and COO Peng Ye bailed citing ‘personal reasons’), but that hasn’t stopped it from teaming up with other companies to strengthen its foothold in China. Earlier this month, word got out that Baidu was setting up a new independent online video company in partnership with Hulu investor Providence Equity Partners.